As I often do, I searched for a short bush walk to explore after work today. One great thing about the North Shore (or many areas of New Zealand really) is that you are never far from some form of nature walk. Heading towards the Birkenhead area I stopped at a place called Eskdale Bush. 10min into the walk and it became obvious that my flat soled leather work boots were not very well equipped for the completely sodden wet terrain. Dodging the muddy patches, I still managed to get ankle deep, remarkably without ending up on my backside. Mud aside, Eskdale Bush is a wonderful walk with numerous tracks one can turn into. Surrounded by the suburbs, there is no real risk of being badly lost. 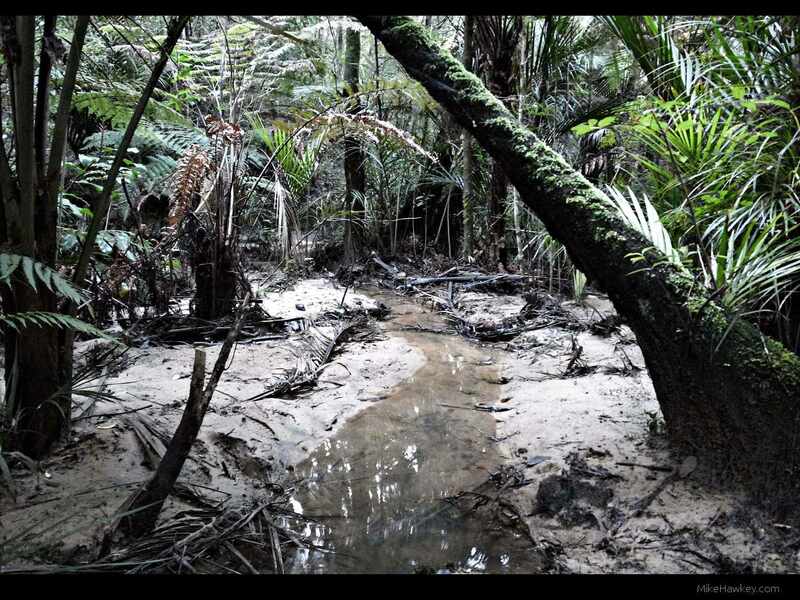 Just as I hit one of the lower and deeper parts of the bush I came across a small, possibly newly formed, stream. With the Ricoh set to 800iso I positioned as low and stable as the slippery surrounding would allow and followed the stream into the forest. In post production using Gimp, I felt a little lazy today and applied the ‘national geographic’ filter – one I often like the out of the box result with. After the loss of my Olympus Mju over the weekend, I took delivery of a cheap as chips Samsung Fino 140 pocked film camera today. Although nothing special it looks to be a very nice late model film shooter with a 38-140mm lens. I’m not expecting much, but am looking forward to seeing how it performs with some B&W film…that’s after I finish the film already inside it!